In recent years I have completed a number of photography commissions for Shape an award-winning Web Design / Digital Agency based in Greater Manchester. The team at Shape are great to work with and always call on me when the client is in need of some quality food or product photography. 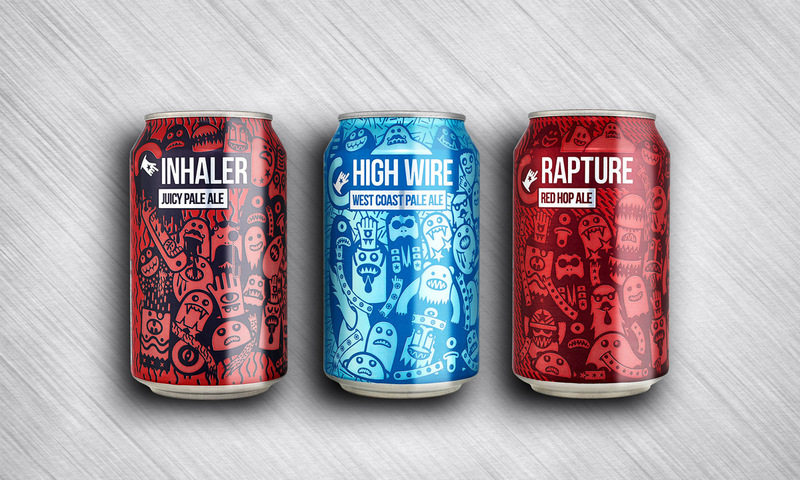 In this instance they were working on a brand new Craft Beer website and needed some simple product packshots of cans for an E-Commerce website i.e. clean and simple, well lit product shot cut-out against a white background. Whilst this was a relatively straight forward piece of work, it required a completely bespoke product lighting setup in response to the specific characteristics of the product i.e. cylindrical and reflective. Before receiving the actual products I therefore picked up a few samples to work with and spent time on pre-lighting, my objective was to ensure the lighting was even across the whole can, and any reflections in the front of the can were both subtle and complementary. They key element of the lighting setup was to create almost a 360 circular diffusion screen around the product with a cutout for the lens. This prevented any unwanted reflections and allowed maximum flexibility wiht the lighting. For this work I utilised 5 studio lights in total, strip softboxes on each side, another high at the front and similarly one at the back. The final light was positioned close to the screen in order to produce the highlight on the front of each can. With my setup dialed in, I was therefore ready to start straight after collecting the cans I needed to photograph. Once photographed, the products were cut-out in Photoshop and grouped into layers. As the lighting setup was refined and the products are cleaned before shooting them, any retouching required is minimised. Where possible I prefer to work on groups of products within the same photoshop file as I can compare products alongside each other. I can then make any final adjustments and deliver the results to the client. Below is a same of the images I produced on a grey background. I’m sure you will agree that my objective of creating a simple, clear, quality product image has been achieved. Quality is one thing but consistently is another. With experience I have learned to keep all aspects of product photography in check so that I can reliably deliver quality results to my clients.